The president of the UK's Royal Society has warned that onerous restrictions on immigration for scientists would be a "disaster" for the UK economy. 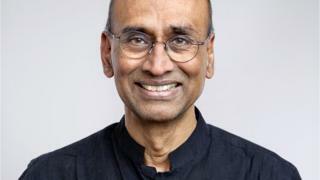 Prof Venki Ramakrishnan has said that growth could be stifled if researchers are not able to move easily. In a speech, he also said that retreating into protectionism would repeat the mistakes of the past. Prof Ramakrishnan made his remarks ahead of the government unveiling details of its industrial strategy. Addressing fellows of the Royal Society, he said that science had always been a global enterprise and depended on the free flow of people to bring in new ideas and expertise. That, he said, would need to continue after Brexit. "A major reason for the success of UK science and technology is that it has been open and welcoming to the best talent from around the world," he said. "Currently an EU citizen working here has to fill out a 90-page form with lots of onerous and unnecessary reporting to gain the right to remain. "In the future, rather than making things worse by having EU citizens go through the same mass of red tape that others currently do to gain the right to work here, we need to improve the situation for everyone by streamlining procedures so they are fair, transparent and efficient." Prof Ramakrishnan said that 30% of the UK's academic research staff were from abroad and a third of UK start-ups were founded by non-UK nationals. "We are second only to the US as a destination for global talent. Their presence ensures that we remain first rate, and, importantly, produces a first-rate environment for training home-grown talent. Losing them would be a disaster for our economy." The Nobel Prize winner added that he believed that people voted for Brexit were not against movement of highly skilled labour into the country. He also said that including students as part of the migration figures is both "unreasonable and a poor strategy". He said: "Only a small fraction of them stay on mostly to our benefit and they can be counted at that time. The rest return to their home countries and are valuable links with the UK. They become future leaders and are more likely to look at the UK as natural partners for trade and investment. "By putting up unnecessary barriers to students and restricting opportunities for them, we are in danger of turning away entire generations of future partners who would be well disposed towards us". But Prof Ramakrishnan welcomed the extra money for science and infrastructure the Prime Minister announced last week as well as the prospect of an industrial strategy. "Science and innovation must be an essential component of such a strategy. The recent announcement by the government of significant increased spending for research... sends a strong message that post-Brexit, the UK is determined to continue to be a leader in science and innovation," he explained.